Three Berkeley Lab researchers have proposed an innovative way to improve global climate change predictions by using a supercomputer with low-power embedded microprocessors, an approach that would overcome limitations posed by today’s conventional supercomputers. In a paper published in the October 2011 issue of the Journal of Advances in Modeling Earth Systems, Michael Wehner and Lenny Oliker of the Computational Research Division and John Shalf of the National Energy Research Scientific Computing (NERSC) Division lay out the benefit of a new class of supercomputers for modeling climate conditions and understanding climate change. Using the embedded microprocessor technology found in cell phones, iPods, toaster ovens and many other modern day electronic conveniences, they propose designing a cost-effective machine for running these models and improving climate predictions. Although cloud systems have been included in climate models in the past, they lack the details that could improve the accuracy of climate predictions. Wehner, Oliker and Shalf set out to establish a practical estimate for building a supercomputer capable of creating climate models at 1-kilometer scale. 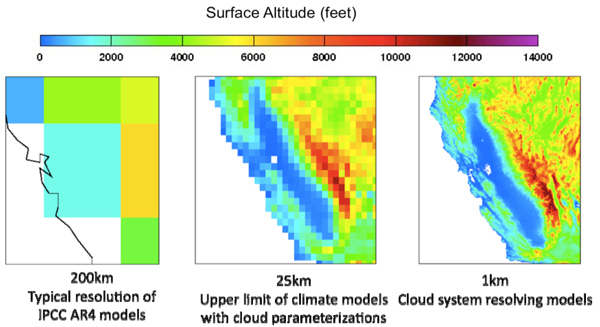 A cloud system model at the 1-km scale would provide rich details that are not available from existing models. Historically, supercomputer makers build larger and more powerful systems by increasing the number of conventional microprocessors — usually the same kinds of microprocessors used to build personal computers. Although this approach is feasible for building computers large enough to solve many scientific problems, a system capable of modeling cloud systems at a 1-km scale would cost about $1 billion using this approach. The system also would require 200 megawatts of electricity to operate, enough energy to power a small city of 100,000 residents. In their paper, “Hardware/software Co-design of Global Cloud System,” the researchers present a radical alternative that would cost less to build and require less electricity to operate. The Green Flash is not merely a concept. Wehner, Oliker and Shalf, along with researchers from UC Berkeley, are working with scientists from Colorado State University to build a prototype system in order to run a new global atmospheric model developed at Colorado State. In April 2008, Berkeley Lab signed a collaboration agreement with Tensilica, Inc. to explore such new design concepts for energy-efficient high-performance scientific computer systems. The joint effort is focused on novel processor and systems architectures using large numbers of small processor cores, connected together with optimized links, and tuned to the requirements of highly-parallel applications such as climate modeling.